Dr Kathija Adam is not your average lecturer. 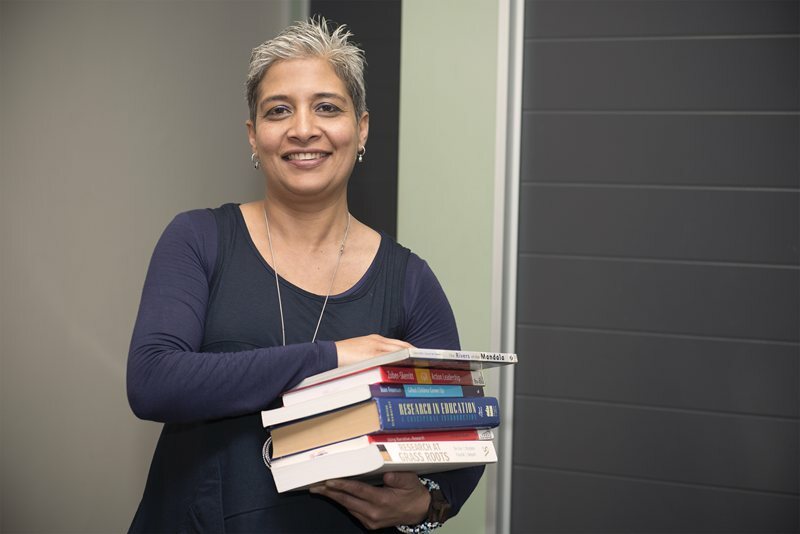 When she has to teach a module, this inspiring educator – who last month won a prestigious award for teaching excellence from Nelson Mandela Metropolitan University – reaches the desired learning outcomes in unusual ways that typically leave her students changed for life. 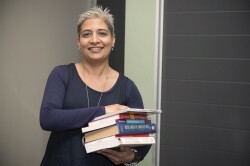 For instance, when she had to teach “Curriculum Design and Development” to NMMU students completing the Postgraduate Certificate in Education (PGCE) last year, she could have followed the typical talk and chalk approach, equipping her students with the necessary theoretical knowledge to pass the module. Instead, she chose a different mode of delivery, shifting them from the comfortable corridors of NMMU’s South Campus in Summerstrand to the university’s Missionvale Campus, surrounded by Missionvale township. Then she took it a step further and partnered with nearby Khwezi Lomso High School so that the teacher candidates could get first-hand experience of where and how 80% of the country’s learners study, and gain insights about whether the current national curriculum is truly meeting the needs of most South African learners. It was a perspective-changer for the PGCE students – many of whom matriculated at former Model C schools in suburban areas, and had never set foot in a township – who found themselves visiting pupils’ homes, talking to their families and caregivers, and getting a glimpse of township life after dark. “I have a living systems approach to module design. It allows me to teach in ways that tap into my student’s learning beyond the content [being taught] … The biggest gift is when students have a paradigm shift in their thinking. It’s an authentic process – they do their own learning and make up their own minds,” said 43-year-old Adam, who, in addition to teaching at post- and undergraduate level, is also the director of NMMU’s School for Continuing Professional Development in the Faculty of Education. The results of the Missionvale experience were comprehensive “source books” where students recorded and reflected on their experiences and, ultimately, eight short films produced by the students. These were collated into a 60-minute documentary called “Heart of the Who” which was screened at the Grahamstown National Arts Festival this year. Sixty-five per cent of her past students teach in schools like Khwezi Lomso. She stays in touch with them, providing advice and insights – especially as many of them find themselves working against the system when trying to implement positive change in schools that are more used to surviving than thriving. She also never teaches the same module more than three times – opening opportunities for her colleagues to also “take ownership of the space”. These included Botswana, Zimbabwe, Uganda, Somalia, Ethiopia, Egypt, Saudi Arabia, Qatar, Bahrain and the United Arab Emirates (UAE). It wasn’t easy getting jobs as a scientist in many of these countries, but she quickly found employment as a Maths, Science and English teacher. Continuous part-time studies throughout her travels culminated in her doctorate degree on transformation and change in education from the University of South Africa (Unisa). She taught the richest of the rich, including royalty, at Middle Eastern universities – and the poorest of the poor, including nomadic desert-dwelling Bedouin in the Rub al Khali – the “empty quarter” regions of the UAE. And perhaps because of it, she’s determined that her students gain raw, real insight into the realities of South African education.